On the day that Birmingham City Council launched its Birmingham Mobility Action Plan, Birmingham Friends of the Earth handed our Let’s Get Moving petition to Councillor Lisa Trickett, Council Cabinet Member for Green, Smart and Sustainable City, alongside representatives of St Peters Church Hall Green, All Saints Church Kings Heath, Kings Heath Residents Association and Pushbikes the Birmingham Cycling Campaign. While the Birmingham Mobility Action Plan contained an aspiration for the Council to continue to invest £10 per person per year on cycling and walking, it needs to take concrete steps to ensure this happens for at least the next 10 years, in order to urgently tackle Birmingham’s illegal and dangerous levels of air pollution. Poor air quality contributes to 520 premature deaths every year in Birmingham alone. The UK Government is currently being taken to court by the European Commission for failing to do enough to protect citizens from poor air quality in 16 cities which are over EU limits for Nitrogen Dioxide, including Birmingham. Birmingham is also one of three UK cities that will not meet these limits until 2030 under current plans. As well as over 2,000 members of the public signing a petition, the campaign has gained support of community and faith organisations across the city, including several Neighbourhood Forums, Birmingham Cathedral, Birmingham Central Mosque and Birmingham LGBT Centre. 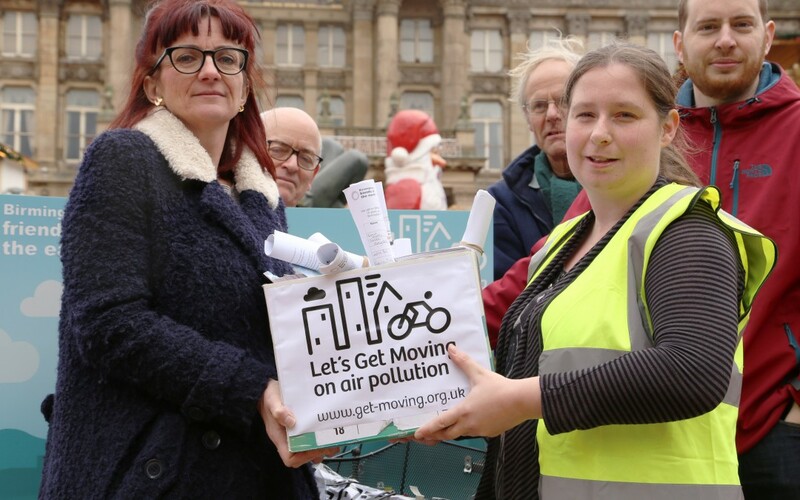 “The recent investment from the Cycle City Ambition Grant was very welcome, however it is nowhere near enough to redress Birmingham’s historical underinvestment in cycling, and seriously tackle Birmingham’s dangerous air quality with the urgency we need. “The council is fully aware of the risks that are posed by poor air quality from road emissions, as raised by Friends of the Earth in its campaign. “Birmingham has an Air Quality Action Plan in place which seeks to achieve a reduction in emissions. This is supported by the emerging Birmingham Development Plan and the Birmingham Mobility Action Plan which will set out a long term vision for sustainable transport in the city. “The objectives of these will be delivered through closer working between departments and joint working with external partners including the regional transport authority and the surrounding boroughs. While this hand-in marks the end of the group’s current work on Let’s Get Moving. We will be working to ensure the Council turns its aspirations to commitments!